Diana Cooper didn’t know what to include in the Surviving Sandy show when she was invited. She was busy, in the midst of several other shows, and skeptical, even nervous to revisit such a sensitive area. For Cooper was greatly affected by Hurricane Sandy. She lost countless works, years of early efforts (done in college and in her mid-twenties, most of which can’t be recreated). In other words, with Sandy, she lost a sense of who she was and how she got there. Diana Cooper, “Constellation Vanity (2),” 2013. Wood, mirrors, digital prints, PVC, plexi, gels, sono tubes, canvas, felt tip marker, Velcro, acrylic on walls, 9′ 4 1/2″ x 26′ x 6′ 9″. Courtesy of the artist. Photo by Cathy Carver. She agreed to do the show, though, and knew she wanted to show work that was created in the wake of the hurricane. She included four works, all of which seemed to fit loosely within the post-Sandy theme: Silver City reflected upon the city post-disaster, itself a plastic sculpture of small skyscrapers, like a jagged recreation of the skyline, ravaged by industry or the elements; in Safety Last she took on the exhibition space itself and issues of power, installing a large, cheeky recreation of a caged outlet that was inspired by a paint-covered one in the gallery space; and in Bale she collaged clips of compacted blocks of recycled materials and other detritus with her own photos of images from security cameras. But it was Constellation Vanity, Cooper’s most commanding piece in the show—and the one she says people asked her about the most—that was the most in sync with the show, the building, and the cultural climate. Upon seeing pictures of the industrial building in which the show would take place, raw and rectilinear, she was inspired by the piping that lined the ceilings and walls like varicose veins. Upon seeing pictures of the industrial building in which the show would take place, raw and rectilinear, she was inspired by the piping that lined the ceilings and walls like varicose veins. Specifically, she liked its color, its particular brand of red—somewhere between Candy Apple and Carmine. A little research revealed a law in New York City mandating that all fire-suppression piping—exposed standpipes and sprinkler piping—must be painted “Safety Red.” In the show’s four floors and thousands of square feet of converted industrial space, there’s a lot of piping, and therefore, a lot of red. 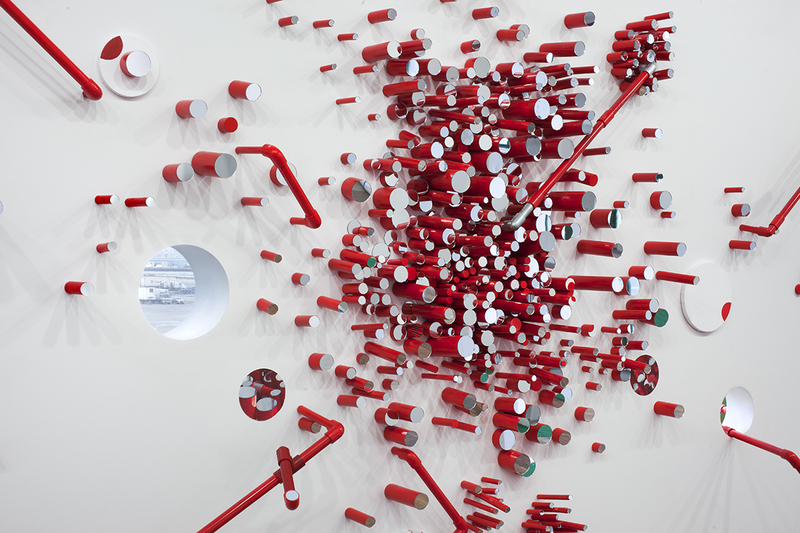 Constellation Vanity is made up of dozens of pieces of empty plastic piping, colored the same shade as the water-bearing ones above, and positioned to be extruding through the wall toward the viewer. They are hollow and condensed together, arranged like a grouping of stars—random dots until you draw lines and draw shapes. Many of them are hollow; others contain little mirrors, and therefore, little, incomplete reflections of ourselves. Diana Cooper, “Safety Last,” 2013. 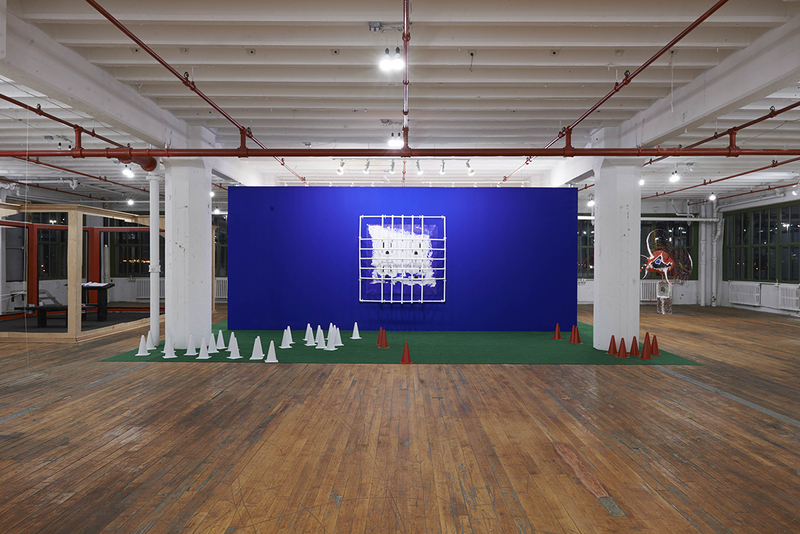 Inkjet print, PVC, acrylic paint, Astroturf, plastic cones, 10′ x 29 x 22′. Courtesy of the artist. Photo by Zack Garlitos. Within the context of a show where water plays such a large and versatile theme, this is haunting. Not only do the Safety Red pipes carry water, they are marked as such because they suppress the disaster; water is the cure for the disaster, not the disaster itself. And Cooper’s pipes suggest this, but they also suggest something more sinister—that the pipes are empty, meaning they won’t help us when the next disaster comes.